It’s official: comparisons to Pavement are one of the most useless clichés of Indie rock reviews. It seems like these days, any band that plays with tempo, layering, melodies, and/or records it themselves gets compared to Pavement. I think it’s because as a reviewer you have only a limited verbiage to evoke a reference point for their readership. And when someone says “Pavement!”, I guess you’re supposed to think of a bunch of musicians who are so into their music and recording that they’re sitting around in a basement recording studio, drinking beer and playing songs into an 8 track for fun. In other words, I suspect that people are trying to evoke the imagery of musical masturbation and experimentation, but in a good and non-pretentious way. Me? I don’t like Pavement (the last time I saw them in concert, they were so horrendous that I left after 30 minutes), which may explain why I find that comparison so annoying, and so ubiquitous. So how does that little rant play into this review? Well, when I got the package for the Artichoke CD, every freakin’ press clipping compared them to Pavement. And when I started listening to the album, I just didn’t get that comparison. So let’s start this off right: Artichoke are a band from California. Apparently a four piece. I’m not sure what comprises the Santa Monica scene these days, but if Artichoke are any indication, then I’m thinking it’s got the proto-psychedelic meets powerpop Indie rock thing going on. However, lest you think that Artichoke’s music can be completely contained by the afore-mentioned comparisons, let me state that they go all over the board musically, and that’s a good thing. For instance, the first song, What a weekend ha ha ha, bears a striking resemblance to Weezer’s Suzanne. However this same song also contains a change of rhythm and off-kilt vocals that Weezer would never dream of. Likewise, the next song, Dismayed, starts off like something from Texas’s Deathray Davies, with the quick garage beat and the geeky/sleepy vocals. Furthermore, you can find several songs that recall The Pixies circa 1990 (such as Noah, my personal favorite off the album). However, once I get a little deeper into the album, I can hear bits that might have come from Sebadoh, and there’s even one song Abstract Red Adam which has the hallmarks of the British shoehaze sound of the early 90s. Nevertheless, despite my comparisons, which suggest wide-ranging influences, there is a coherence to Artichoke’s music. Perhaps it the consistently strong, happy keyboard bits which are not necessarily dominant in individual songs, but remain a constant, low-key, unifying presence throughout the album. More likely it has something to do with the vocalists’ slightly high-pitched, slightly-nerdy sound, which of course reminds me of the psychedelic pop aesthetic one keeps hearing out of Athens, GA, these days. Of course when you’re dealing with almost any album, there will be occasional mis-steps. However, despite its 17 song length Evaporation doesn’t have too many. The primary issue I have comes from the occasional noise/instrumental interludes which sound like the slightly-sunbaked experiment of someone with a 4-track recorder and too much time on their hands. Furthermore, I have to confess that overall I was impressed by the band’s use of recording technology: the balance of vocals and instruments seems dead on, and they don’t fall victim to any of the issues which normally plague low budget/lo-fi DIY recording. On the whole, I like Evaporation: it’s a good little album that grows on you with repeated listenings. Although they’re based in California, I’d like to see Artichoke tour, and make it out here to Georgia. The strength of the recording is its energy, which is something I’d think Artichoke possesses a great deal of in their live show. 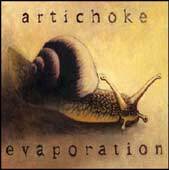 Artichoke's website, where you can order the album, if you are so inclined.